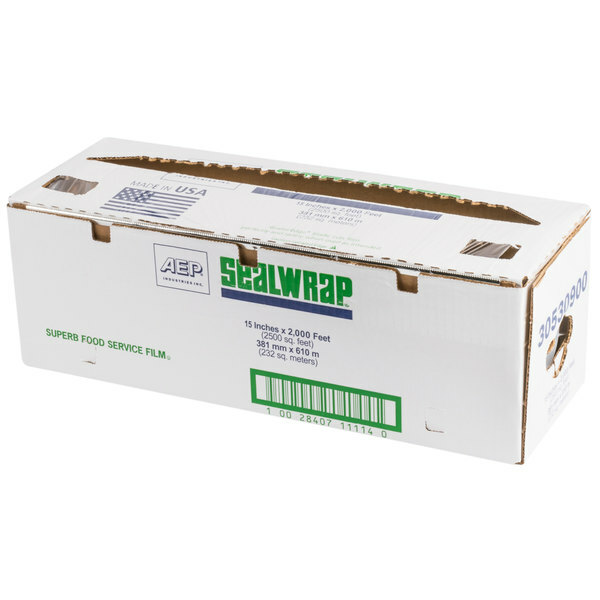 Keep your food sealed at optimum freshness with Berry AEP 1504342 15" X 2000' film wrap! 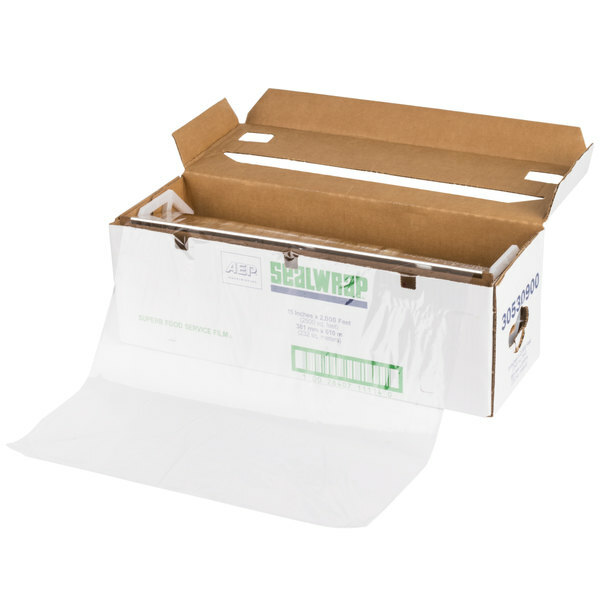 The 15" width is great for covering containers or food items with large surface areas. 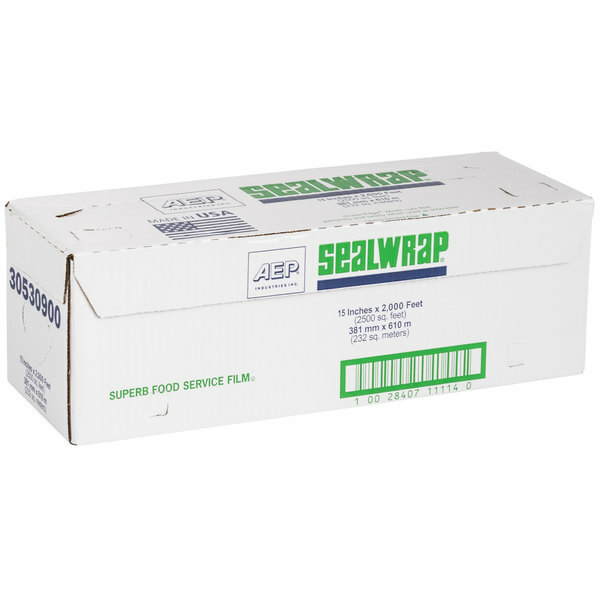 A 40 gauge film, this wrap offers the perfect cling to achieve the tightest seal for a variety of applications. This feature prevents gaps between the surface and the wrap to ensure that no air gets through to the food and that nothing inside leaks out. 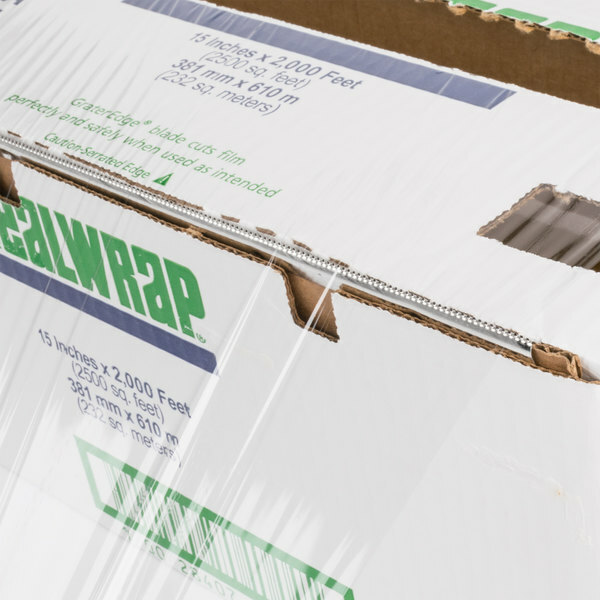 The clear material provides product visibility so that your products can be easily identified even when wrapped. 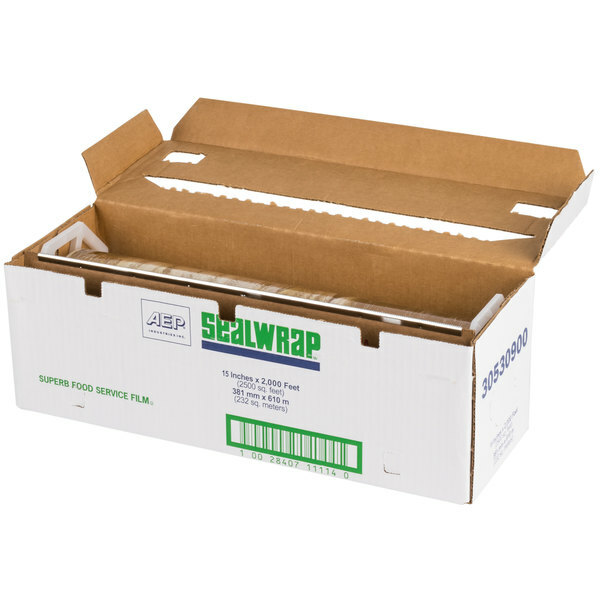 The box includes a convenient serrated blade to allow for quick and safe cutting every time. With 2000' of film wrap in every roll you can be sure that your business is in good supply! 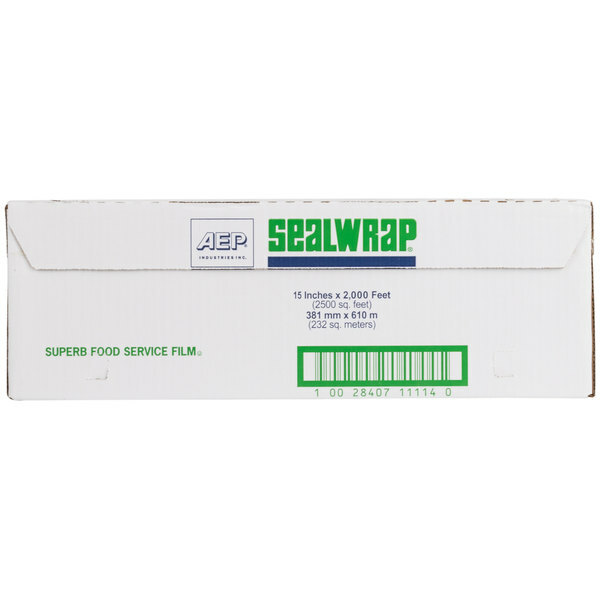 Whether you're wrapping brownies in your bakery, sandwiches and subs in your deli, or covering food in your restaurant, this Berry AEP 15" x 2000' film is sure to suit all of your needs. The film was ok. Not as good as the brand i get locally. it does the job but doesn't grip the containers as well as i would like. If you have a brand that you use and like already I would stick with it. Thank you for the review. We’re sorry this has not worked well for you. 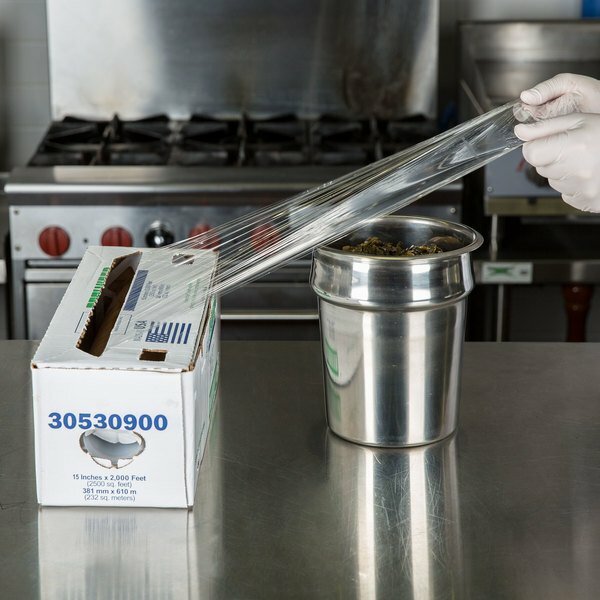 For an alternative that might better meet your needs, try this Choice Safecut 18" x 2000' Premium Foodservice Film with Slide Cutter instead! WHOA that's a lotta wrap (yet in the shop it won't last as big as it looks) which is ok, I can always get more, BIG roll and it clings good, I was worried about that but not anymore! One word....Satisfied! That is the perfect word to describe how I feel. I have looked around for the best wrap at the best price and where else but the Webstaurantstore would I find it? This wrap perfectly bonds everything I wrap, while offering a clear view of my deli trays. Well done guys! High quality film and does not tear off like some brands, we use this film for hot and cold pans and it really clings good to pans. The price is outstanding too!! Good size plastic wrap. The 15 " size makes it easier to wrap foam trays. The thickness of the plastic is perfect and does not pierce easily. I bought this for myself. Personal use, not for use at my business. I have to say that the 15" wrap is ideal for home use. Far better than anything you can find at the grocery store. Larger than the 12" roll I had been using for the past 2 years, and FAR better than buying an 18" roll that just turns out to be way too much all of the time. This plastic wrap is great! I can keep it on the counter and it makes wrapping food and cutting saran wrap really easy without cutting yourself. cling wrap are great for many things, especially for making sure that items are covered. This product may not be a name brand but it's quality is a good as they are. The 15"x2000" Film w/ Cutter Box. 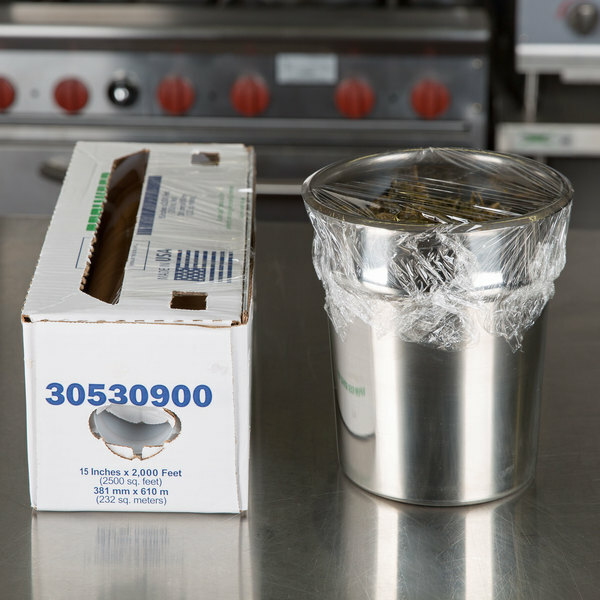 Is great for wrapping Cakes, or cupcakes, waiting in the freezor to be decorated sometimes we do alot of baking one day ,and freeze it for when it is ordered. It is also great for covering left over food.Works great. This is a nice quality plastic wrap for food! Nice small sized box is perfect for leaving on the counter in one spot so everyone knows where to find it!!! Works well. We bought a few milers and sort of put this box up on a shelf for back up, but it does what its supposed to do. Wrap Stuff. USE THIS AT HOME! I am sure everyone has tried ripping off a piece of plastic wrap from those little boxes the grocery store sells and it is impossible! The box is too light to stay put on the counter so you have to hold it and then when you tear your piece you end up with an unmanageable mess. This is my solution. No headache and VERY cost effective. I won't be buying plastic film for a while! I was drawn to it by its thickness—it's sturdier than supermarket wrap. The built-in cutter is a boon, making tearing quick and easy. The size of the roll somehow affects how much I use—I don't ever feel like I have to skimp because I might run out soon. It stretches nicely for a taut fit to cover a bowl.